The internationally acclaimed theater director, Roysten Abel had filed a suit against the defendants seeking permanent injunction from infringing the copyright, moral rights and passing-off of his dramatic production ‘The Manganiyar Seduction’, an original dramatic work under Section 2 (h) of the Copyright Act, 1957. This larger than life dramatic work involves a dazzling union between Manganiyar music (a hereditary class of highly skilled folk musicians from the Thar Desert of Rajasthan) and the visual seduction of a unique set consisting of a three dimensional, vertical stage made up of approximately 2,500 kilos of solid wood and metal scaffolding and a platform draped in vivid red curtains and electric light bulbs, which is 40 foot by 25 foot in size. 43 musicians are then seated in 36 red-curtained cubicles arranged in four horizontal rows one on top of the other and the dramatic performance begins when a single cubical lights up and the first singer beings his song. Soon another cubicle lights up and another, thus creating a dramatic and astounding build-up of musical instruments and voice as young men, women, children and the elderly of the Manganiyar community use the theatre to create magic in the music. 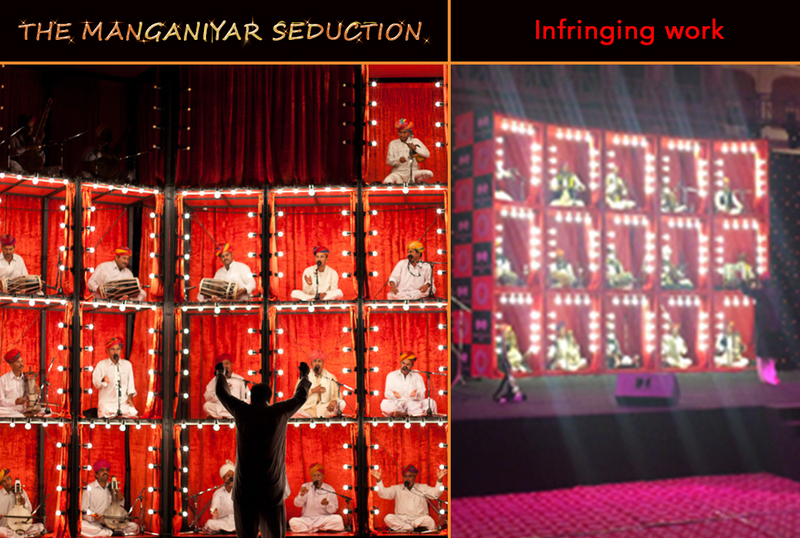 The defendants had copied plaintiffs’ fanciful title ‘The Manganiyar Seduction’ as well as the unique feature of the show, i.e., the manner in which the musicians are seated on stage in cubicles and the lighting of the show. The suit was decreed by virtue of a settlement arrived at between the parties wherein the defendants not only acknowledged the ownership of the Plaintiffs in the original dramatic work ‘The Manganiyar Seduction’ but also agreed to pay damages of Rs.1.5 lakh along with issuing a public apology to the plaintiffs. Read about another Brainchild brought to life by Roysten Abel.